It’s tough to hide a beach on the North Shore! That said, the following North Shore Beaches aren’t on everybody’s beach radar. And with world-class beaches like Trunk and Cinnamon drawing most of the attention; these beaches go relatively unnoticed! So if you’re looking for a spot away from the crowds – give one of these gems a try! We can’t promise you’ll be alone …but you just might be …! 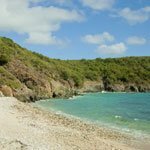 This secluded St John beach is well know by the local charter captains but rarely visited by anybody else. One of the reasons – it’s tough to get to by any other means than a boat. But for the adventurous, just snorkel/swim/kayak to the east side of Hawksnest Bay. About 200 yards from the beach at Oppenheimer, along the eastern shoreline, is a gem of a pocket beach. Mermaid’s Chair Beach is tiny – perhaps 25′ wide with soft white sand. NOTE: It does get shade in the first half of the day – and the beach is very narrow at high tide. lies to the west of Cinnamon Bay beach. It’s best reached by going west along the Cinnamon Bay beach. 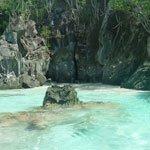 At the end you’ll pick up a narrow trail that leads to Little Cinnamon Beach. Snorkelers will enjoy searching for the sunken airplane that’s just off the eastern section of the beach. lies to the left of the popular beach at Hawknest Bay. A short hike through the thicket to the left of the parking area brings you to a little pocket beach. Most travelers don’t even know it’s there. The path isn’t the easiest since it will require you to navigate across some sharp rocks and stones. But just take your time and plant each foot carefully. No rush. You’ll get there in no time. Stake out your spot and enjoy! lies between Big Maho and Francis Bay Beach on St John’s North Shore. 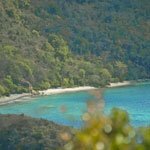 You can swim/snorkel, take a dinghy or hike down from the former Maho Bay Campgrounds. 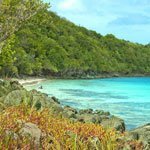 This little crescent of beach gets plenty of shade – but does provide a bit of easy-to-get-to adventure if you’re tired of the crowds at Maho or Francis Beaches. located in Hurricane Hole just past Coral Bay. 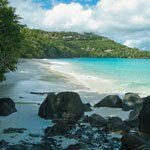 you’ll need a kayak to get to the couple of sandy beaches that line Whitesand Bay. Enter where the mangroves meet East End Road. Head out and back to the west ( toward Coral Bay and Fortsberg). 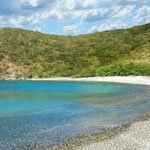 Just around the first point you’ll see several narrow sandy beaches. Wonderful spots to grab some beach time away from the more crowded beaches of the North Shore. located on St John’s East End is Limetree Cove. You can reach it from Haulover South or Vie’s Hansen Bay Beach by kayak. There are several small pocket beaches; but the only sandy beach lies right in the middle of the cove. Because the properties surrounding the cove are private – you’ll have to swim/snorkel/kayak to this little gem! 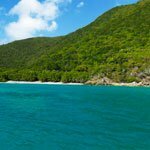 No worries about the little cottage right above the beach – you are free to use the beach right up to the high water mark ( where the vegetation starts) throughout the US Virgin Islands. 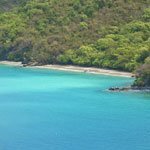 while not technically the East End of St John, Mennebeck Bay is really only accessible via the East End. Located just west of Haulover North, this rugged coast is lined with treacherous coral reefs and high surf. If you’re looking for the ultimate adventure location, Mennebeck would be on the short list. It does have a sandy beach; but only a narrow bit of sandy access to the water! Lots of current, steep access and a nearly impossible spot to anchor make this one of the few places we don’t recommend visiting! 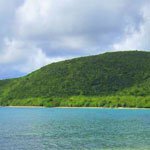 Located between Fish Bay and Reef Bay is a “best kept secret” among residents here. 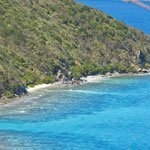 For the adventurous, you’ll discover a secluded sandy beach with dramatic waves and a small cay, Cololoba Cay, just off shore. 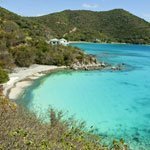 It’s not a good swimming beach because of rocks, surf and urchins,; but a decent snorkel and a wonderful spot to enjoy St John all to yourself. 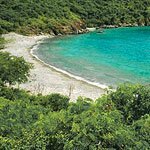 Check out this off-the-beaten-path location on Flash Earth before deciding to make the trek … Map of Cololoba Beach, St John or reference our Secluded Beaches of St John Map [ above or via the link]. Looking for a breathtakingly-rugged spot that’s doesn’t get crowds? Then this off-the-beaten-path “beach” might be right for you. But first you should know, the beach is cobblestone and coral, requires a 4X4 drive and hike and the bay can be subject to rough waves. Still reading? Then Europa awaits you. Pack a lunch and drinks and make a day of it. Snorkeling is best toward the eastern shoreline. lies just west of Salt Pond. It’s “beach” is pebble and stone – but it’s a great spot to spend a secluded day. Snorkeling is best along the western shoreline ( right) and treats snorkelers to dramatic structure, arches and caves teaming with fish and corals. Kiddel is reached by taking the first left after Salt Pond and then bearing left at the fork in the road. There are villas out here but this is definitely a 4×4 kind of adventure! a couple of bays west of the ever popular Salt Pond Bay lies Grootpan Bay. It’s reached by taking the left just after Salt Pond. The road itself is narrow and poorly maintained – but well worth the trip. The beach at Grootpan is sand turning to pebble the farther you go from the parking. The water is beautiful and the bay is surrounded by a dramatic windswept landscape. For the more adventurous ( and physically fit ) there’s Genti Bay. You’ll need to arrive by sea or, as is more common, hike the Reef Bay Trail. The beach is white sand but the water is a mix of coral and sea grasses. Take great care when entering the water. We recommend watersocks! Another remote beach that is for the adventurous! Parrot Bay has a white sand beach and some wonderfully private spots for sunbathing. However, the water is shallow with a strong surf break just off shore. We do not recommend swimming or snorkeling here. Just soak up some sun and pretend you have the island to your self!